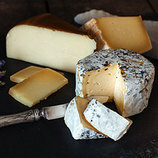 Paso Vino is a Spanish style cheese made with cow's milk from a neighboring dairy. Once the cheeses are molded, they're washed with a local Syrah, then aged for approximately 6 months. The cheese has a beautiful aroma of boozy red berries, while the paste is tangy and nutty with a creamy mouthfeel. Paso Vino is a perfect snacking cheese paired with a glass of Syrah and a handful of Marcona almonds.